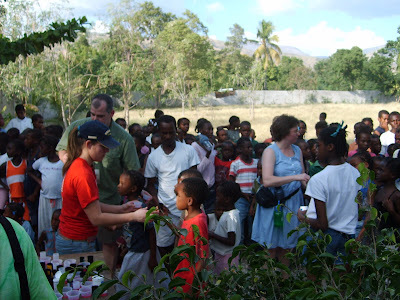 Here are two photos from the Barbancourt feeding center, taken on Friday. The rest of the photos are of activities that took place on Saturday. The plan for Sunday, 5:30 am eggs, 6am departure, two hour mule ride, church at 9am, lunch with the people in the mountains, head back to the mission. Troy and I wish the whole New Joy crew could be here, this is SO fun. Everybody is getting better by the way, thanks for praying. The group finished off strong yesterday, I think everybody was pretty tired and feeling the heat and culture shock by bed time ... all report a good night's rest. This morning Britt took a bunch of the young and ambitious up to Petit Bwa. Paige is attempting it for the first time ... she has wanted to for soooo long, hopefully they are taking their time and not pushing to hard, it is not an easy climb. The Pastor's training has begun, Scott and Dave are guest teachers this morning. After lunch we are taking everybody to the market then returning to the mission to see if there is energy left to work in the medical clinic. We all need good rest tonight, as we will be leaving at 6am to start our journey to a mountain church for Sunday worship. We are making wild and crazy New Year's Eve plans ... we'll let you know how that turns out. Gotta go ... have a great Saturday and Holiday Weekend! I know that friends and family of the NewJoy Church team are waiting to hear what their loved-ones are up to down here ... so here is a brief mid-day rundown. Scott Farkas and Dave Foy argue a lot. It is entertaining. Dave is a night person. That works fine, until 6am arrives ... then, not so much. Dave was 15 minutes late to the prayer rock this morning. Most of the team had to ride in the back of the truck after dark for a two hour drive home from Port last night, everyone was brave and did well. We have toured the mission, gone up to the dam and looked around the village. 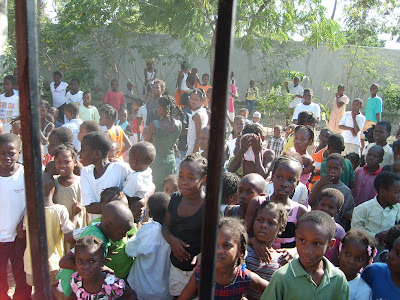 The group just left to take de-worming medicine to a satellite feeding center and de-worm approximately 350 kids. 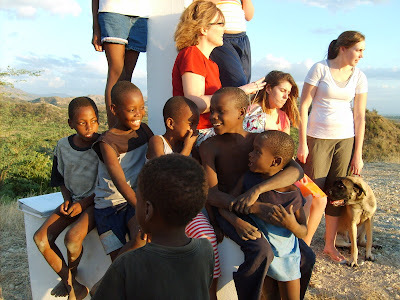 Dave Foy is working on behalf of a lady in MN who is considering building a school in Haiti and is checking out the land Lifeline owns over at one of the satellite feeding centers, that would be an amazing thing if it all comes together. God thinks big and connects people in ways we can never even imagine. Dave is reporting his findings to her later tonight. Thank goodness for the Internet! All the teenagers and kids seem a little overwhelmed but everybody is hanging in there and slowly absorbing it all. The term "sensory overload" had been tossed around a bit. For the record Troy hid the cashews, but I know where. I hid the bear-claws and fancy chocolates, no one knows where. Steaks ... we have steaks in our freezer now. The suitcase with a turkey and a ham got stolen. We are a little bummed, but somebody in Port au Prince is having a great New Year's meal soon. 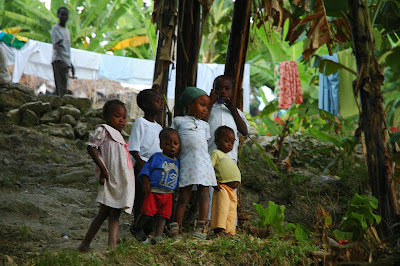 There is a family that is praying and considering coming to Haiti. I don't know if it is okay to give out names, we just learned of it this morning and are so pumped ... please just pray that God helps Lifeline find His people to do His work here. Soon. Britt did some sutures on a machete cut a bit ago, she had a large New Joy audience and it all went well. We wondered if it would make her nervous, but she says no big deal. Our three littlest ones and I still feel pretty cruddy, please pray for fast healing, we want to feel good and enjoy our friends while we have them here. More later if time allows ... thanks for your prayers and to all of you who helped get this group down here by sacrificing financially and otherwise --- THANK YOU! Our friends from New Joy Church in MN arrived safely this afternoon ... we were late to get them. We have never left people standing waiting for us ... We saved that for the day a bunch of people we know came to see us. Ugh. Troy and I got stuck in traffic holding still and were 40 minutes late to the airport. Thankfully, D. Zachary "Zach," the famous one, bailed us out and sat waiting with our other truck for the group to come out ... then he provided entertainment for 30 minutes until we arrived. Everybody is exhausted from getting up at 2am to begin their trip here so they are all headed to bed now. Tomorrow is a full day but we will attempt to get on the blog and update you on the happenings mid-day. For now, we all need rest. Zach ... thank you for the Malaria medicine and the help ... you are the best! 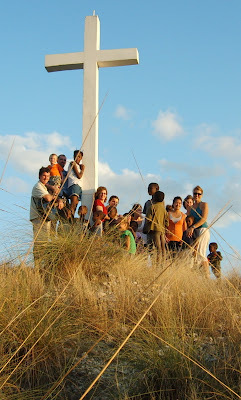 Welcome to Haiti New Joy Church! First of all, I apologize that I haven't been blogging much lately. I haven't had a ton of new medical cases; I am definitely at an all-time low. But it was welcomed since I had finals all last week. I am officially done with my first semester of college classes! I just wanted to post a few of the things that I've seen recently. Nothing too gory, or at least I don't think so. Thank you to everyone who has been praying for us and for all of the sweet Christmas emails. It was a weird Christmas, but a good one none-the-less. I hope you all had a wonderful Christmas and got to spend time with your families and friends. Okay, so this happened when a fifteen year old boy was peeling a coconut; missed the coconut and hit his finger with the machete. It could have been a lot worse, that's for sure. The photo on the left is the before. 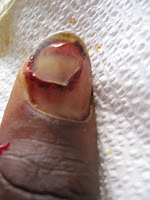 I did a digital block to numb up the thumb so that I was able to take a better look at it w/o causing him pain. The nail was barely attached, so I just went with where it was split and removed it. 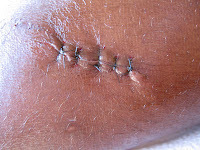 As I suspected, there was a little hole where the bone was exposed, so I did three stitches to close it up. 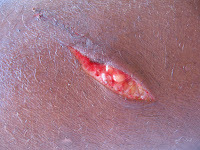 The photo to the below right is what it looked like after I took the nail off, but before the stitches. His family lives up in the mountains so he went up there to spend his Christmas vacation with them. I gave him all the stuff to change the bandages and he'll come find me when he comes back to start school again. This lady lives in the mountains too, so she will change her own bandages and come see me to get the stitches removed in two weeks. If you care to see the other cuts this guy's bad driving/malfunctioning moto have caused; here is the first victim and the second victim . 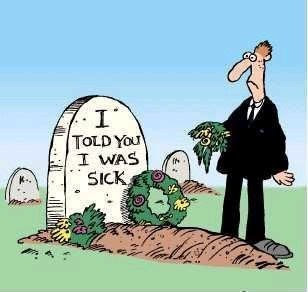 I haven't been feeling well the last couple of days. Yesterday I slept for most of the afternoon. My mom came in to check on me and see how I was doing because I had a new stitches patient here. I don't even remember her coming in, but obviously I wasn't doing well enough to get up and check out the new cut. I am really bummed about it; not necessarily that I missed the chance for more practice, just more that the out-come is not as good as I'd like it to be. 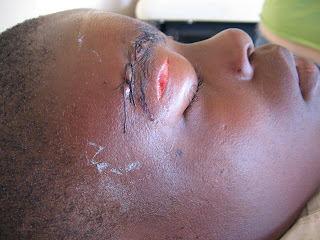 He got cut above his eye when he fell off of a bike yesterday. I have three more weeks off of school before second semester starts, during that time our church and a girlfriend from my school are coming down so it should be a fun few weeks. Last night we were entertained when mom wrote us from Texas needing Troy to make her wireless Internet work. Sometimes people still call from his old job to find out what he thinks about a particular problem or ask if he can help with their computer issues. He is doing tech-support from Haiti. Why not? We have started paying attention to Noah's vocabulary. In recent weeks he has been speaking like a six year old. His current favorites are "abomination" and "actually." The other night he came in and asked what we were having for dinner. I said "tacos." He said. "Oooooh Tacos, noooo I don't want Taco's." I did not say a word, I just gave him a look ... but it must have been a scary look because the next thing out of his mouth was, "Actually, tacos sound good - yeah really good." We forget he is two sometimes, it is easy to do when he thinks of himself as five or twelve. The new phases of parenting we are entering, are just weird. Balancing parenting a two-year-old, pre-schoolers, a pre-teen, and a very mature teenager makes us feel like freaks of nature. In many ways we are freaks of nature. One minute I am potty training one and the next minute I am discussing student-loans and college applications with another. Potty training is so easy. This has easily been the strangest year of my life. It seems impossible that 2006 is over already, it feels like we blinked and it was gone. Everything was open around our house yesterday, none of the local businesses were closed for the Christmas holiday. We had a fun day at the beach. The kids were good and we're pretty sure this baby is the easiest baby ever. She just sits and smiles all day. 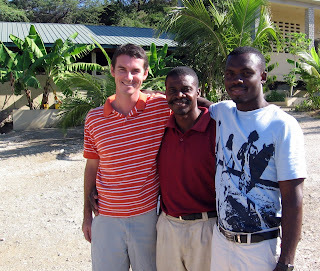 Pastor Rony has been explaining the way Haitians prepare for and celebrate Christmas and New Year's ... We're learning. The Lifeline school kids are out of school until January, making for a quiet week here. The feeding program remains open, the children all come to eat around 1:30 each day until school re-opens and we revert to the regular schedule. We are busy preparing for the team of 12 that arrives later this week. The group is from our home-church in Rogers, MN. We are getting excited to see everybody. 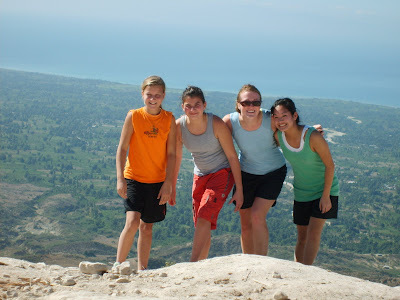 We're making plans and preparing to do a VBS program two days and to go to the Mountains to church with them. We're also hoping to do de-worming medication at one of our satellite feeding centers while we have the extra man-power. Troy finished part of his Mountain trip video ... hopefully he'll post it later today. We hope you are enjoying Christmas wherever you are. 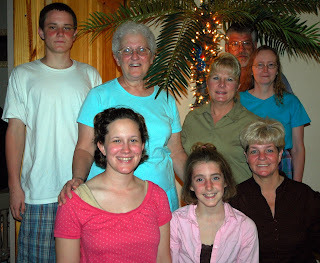 Yesterday we went to Port for church, then to John & Beth's house for Christmas Eve lunch. We had a great time. We picked up an extra person for the week. Our friends who operate an orphanage were leaving for a few days so we took this little beauty to help lighten the load of responsibility at the orphanage. She is not much trouble though, she slept from 8pm to 1am and 1:30 to 7am. :) We are enjoying her happy easy-going personality. We are headed to the beach in a bit to try and get away from working today. If we stay at the mission, we work. There is no such thing as a "holiday" when you work where you live. While the kids were opening presents early this morning, I think Troy answered the gate four times. 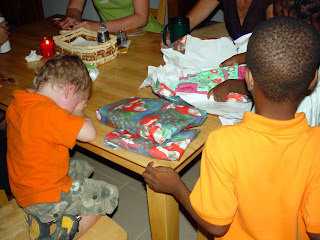 And that was in the time it took 5 and 2 year olds to open four gifts each ... So you understand why we're escaping for the day. It is the best way to enjoy some down time. After we give the cooks their gifts, off we'll go with baby in tow. 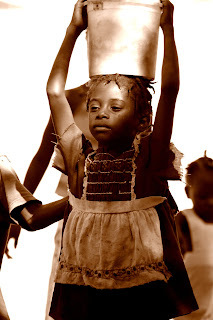 Christmas is not necessarily peace and calm all over the world, there is chaos and hardship in many places, including Haiti. Here is an interesting article to help remind us all to pray for people who are not experiencing full bellies, calm households or peace in their lands today. We're sure you are busy preparing your hearts and homes to celebrate the birth of Jesus. We are getting ready here too and have had some time to reflect further on the incredible gift God gave us when He became incarnate. His presence is the present that means everything." That is simple enough, yet the truth of it rarely penetrates. We love our family, and miss them dearly, but we are coming to the place of realizing it is really not about holiday and family traditions. They are a wonderful part of celebrating, but not the heart of the celebration. The heart is Him. His presence is the present that means everything. Our geographical location or a break in tradition cannot mess with that truth. Every few weeks, I will find myself in some odd situation and I have this flash where my little voice says, "What in the world are you doing here?" It happened last Sunday, Lisa needed a restroom. I was driving and pulled into a gas station known to have water and toilet paper now and again. I sent her in the direction of the bathroom, acutely aware of all of they eyes on me as I sat down at a booth to wait. On the TV was a soccer game in another language. Out the window there were UN tanks driving by and many vendors selling their wares. On the overhead speakers was a Creole radio station. At the front of the store was a tacky looking Christmas tree decorated with lights and bulbs. The air-conditioning seemed to be malfunctioning, the air was thick and smelled sour. All of a sudden the foreignness of it all just hit me, and without warning tears were leaking out of my eyes as I sat in the booth absorbing my surroundings. It is a sense that comes infrequently, yet always catches me by surprise, that says "you're not home." But, what surprises me more is how quickly it passes. A brief moment of emotion and it is gone as quickly as it came. I don't know what to attribute it to other then being good with where God has me, and being at peace with it even when it is strange, and foreign, and feels far-far from "home." It is where I want to be. Smack in the middle of His will. His grace is sufficient to get me through the surprise onslaught of nostalgia and home-sickness. UN tanks and strange smells, being in another land where the rules are different ... God has equipped us to do this, so we'll do it until He says otherwise. His presence is the present that means everything. We want to thank you for reading this goofy blog, for supporting our efforts here, for encouraging us, it has been cool to see the way God has connected us to new friends over this last year. We love you and appreciate you. May your hearts be full of Christ this Christmas. His presence is the present that means everything. 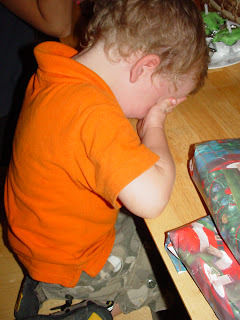 No one can celebrate a genuine Christmas without being truly poor. The self-sufficient, the proud, those who,because they have everything,look down on others, those who have no need - even of God – for them there will be no Christmas. Only the poor, the hungry, those who need someone to come on their behalf, will have that someone. That someone is God. Emmanuel. God-with-us. Without poverty of spirit there can be no abundance of God. At three thirty in the morning on a Saturday, the rocky trail that winds down from Petit Bwa to La Digue is packed. It was full of people, donkeys, and mules carrying goods to the market in Archaie. Some barefoot, all loaded down. We had a tough time navigating and trying to climb with so many coming down the mountain, especially in the dark. I did enjoy two things about hiking in the dark: 1) It was much cooler, and 2) I wasn’t nearly the spectacle of white-skinned-ness that I am in the daytime here. There were many we passed that didn’t even notice the difference in skin color, and some who only noticed at the last second – much to their surprise. It was a nice change. Speaking of change, I left La Digue wearing pants, since the original plan was to ride mules. After about thirty minutes of hiking, though (even though it was “cooler”), I had to stop on the trail and pull shorts out of my backpack. Fortunately it was still dark, so hardly anyone noticed the strange white man changing clothes on the mountainside. About an hour in, Pastor Rony and I were walking together when we met his mother on the trail. I had never met her before, so I enjoyed that. 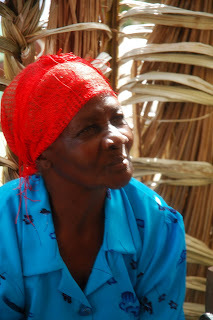 She was on the way down at four in the morning, which meant she must have left her home somewhere around one o’clock a.m. She wasn’t carrying anything to sell, so she was simply hiking all night to come to a market to buy goods for her family that week. How does your commute to Wal-Mart look now? I asked Rony how old she was, and I was very amused by his method of calculating the answer. He told me she was married when she had thirty years, then one year later his older sister was born, who is now 45, so she must be 76 years old. I was shocked. She looks like she’s in her 50’s to me, and was cruising down the mountain like she hadn’t just hiked for three hours. I told Rony she must be living right. 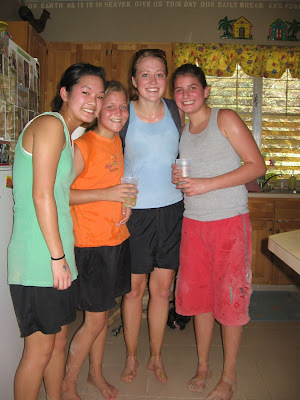 Here’s the best part – Saturday night she was back up in her home town of La Grenade, the village we hiked to. I was dead-tired and laying on the ground while she was making her SECOND trip on that trail within 24 hours. Amazing. By sunrise, we were on a long flat stretch of trail behind Petit Bwa. 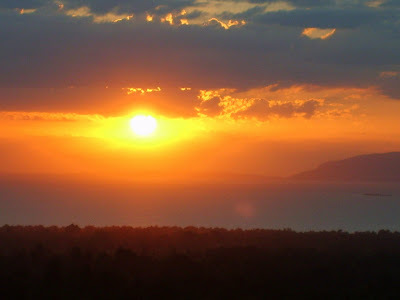 The sunrise was beautiful, and the easy trail was a welcome relief. 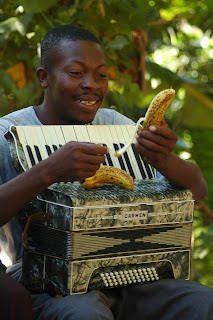 We stopped for one short rest under a tree, and had our first accordion accident. During the transfer from one back to another, the squeeze-box hit the deck. After some testing, it was determined that there was no damage to our beloved traveling sound system, and we continued on. 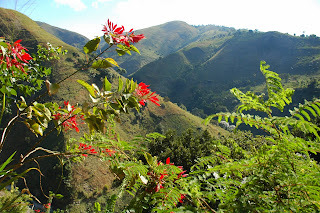 As we progressed deeper into the ‘mountains beyond mountains’, the trail evened out as far as drastic elevation changes, as it varied between climbing and descending quite a bit. The loose rocks and sand slowly changed into mud and jagged jutting rock as we reached the higher elevations. It was considerably cooler, and much greener. I was of course still sweating profusely, but one of my comrades pulled out a jacket to put on once we were back into the forest. 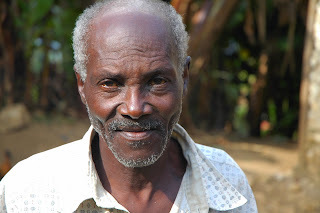 Many of my Haitian friends kept talking about being “cold and stiff”, and worrying about sleeping in the cold and the effects on their health. I on the other hand could not wait to feel something below 70 degrees. 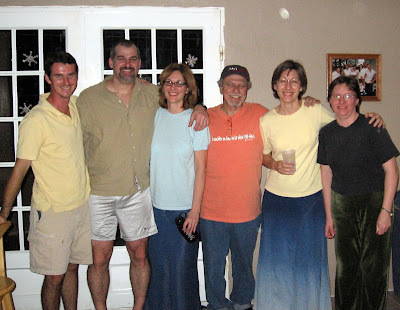 In fact, between the exhaustion – the full stomach from an amazing Haitian meal – and the beautiful cool evening – I’ve never slept better…even though I was on a bed made of cinder blocks and plywood and a mattress of two inch foam. I slept in the Pastor’s home. He and his wife graciously gave up their two-room house for Pastor Rony, his wife, and me. The house was made of sticks covered in sand and white mud, with a thatch roof. The floor was dirt that had been swept and worn down to the rocks below. There was an enclosure behind it made of woven palm leaves for bathing. Down a path about fifty feet away was the latrine – a hole in the ground with a thatch privacy screen. 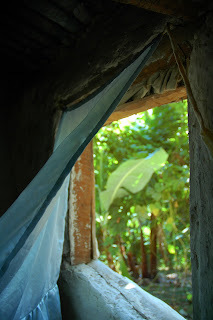 Like many Haitian homes, they have a separate lean-to made of sticks and leaves that they cook in outdoors. Later in the day we continued up the mountain to visit Delpeche. Along the way, I saw the homes of Pastor Rony’s parents, and a few other homes belonging to families of my friends and employees. Outside of Delpeche, I met Madame Rony’s father and visited her childhood home. 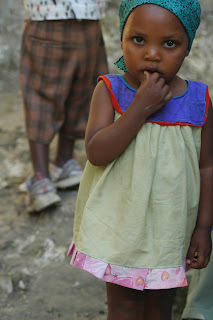 As always, the mountain people of Haiti were warm, welcoming, and wonderful. We visited the family of Merilien, one of Lifeline’s employees, and spent time with his brother. 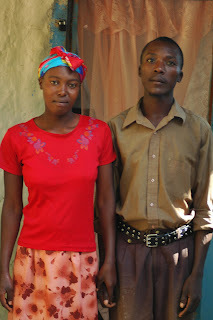 His brother attends the Lifeline school, but has been home in the mountains trying to recover from a serious illness. 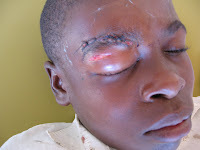 I think he might have Malaria, and he hasn’t been able to walk or hardly eat for weeks. It was very hard to see him laying on the ground covered in ragged blankets. I pray he is recovering, but with no health care available, and the lack of education regarding sickness and treatment here, I don’t know what will happen to him. 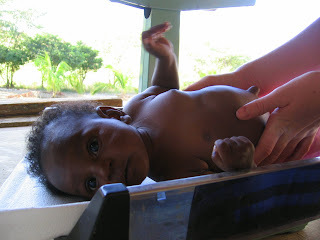 We’re sending medicine to treat Malaria, but beyond that I don’t know what we can do. When we returned to La Grenade for the evening, it began to rain. The Saturday evening church service was postponed, so I layed down to rest. I told Pastor Rony to wake me up when the service was going to start. I woke up to hear the rain pouring down and leaking through the roof. I checked my watch – it was only 6:30 pm. I got up to see what everyone else was doing, only to find that they’d all gone to bed. I had no trouble going back to sleep. I fell asleep to the sound of the rain and roosters crowing. Haitian roosters never seem to know what time it is, contrary to the idea of them crowing at sunrise. Sunday I was treated to a wonderful church service. Everywhere I turned people were hugging me and offering to feed me. If I ever get discouraged, all it will take is a trip up the mountain. The people were amazing and joyful - an inspiration. The trip served to teach me many things, and also to encourage me. These beautiful mountain people are people we could ALL learn something from. In my head, the video version of the trip is coming along nicely. In reality – I haven’t started. Maybe for a Christmas present for our readers I’ll complete that project. But most likely not. My Uncle Rick is one of the neatest guys you could ever meet. Among other things, he is a Pastor, Dad, Uncle, Brother and friend. I keep telling him the world is waiting for his blog, but he cannot be convinced. So, instead we'll just publish him here. Baby Lovely is up to 10 lbs. 10 oz. :) She looks great! Hope's FIRST-mother shares with us that Hope was born on the way to the hospital in the back of a tap-tap in Port-au-Prince Haiti, on Christmas Eve, 2001. How's that for a grand entrance?! Her mother has previously placed three other children for adoption and sadly for reasons we would love to see eliminated she also immediately placed Hope in the same orphanage. We first met Hope when she was just about four months old. This photograph is from that first meeting. 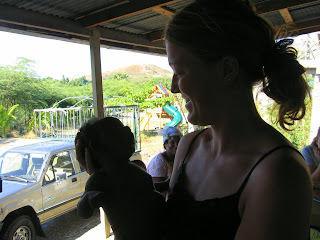 At the time this was taken we had not yet committed to adopting her. Later in the week, a few days after deciding to adopt Isaac, we also decided to adopt Hope. Troy and I laugh about this ... I basically held her non-stop until Troy finally said, "You want to adopt her too don't you?" In my defense I always questioned how difficult it might be to be the only brown face in a white family and I wanted to try to remedy that situation in some small way. From the first time we met her she was a dainty and quiet girl. She has always been a mellow, soft-spoken, patient little girl. She has also always been a tough-as-nails fighter girl. 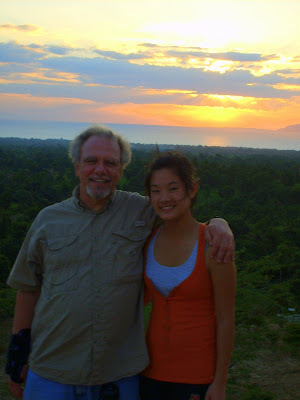 Three weeks later, in mid September, my dad and Paige and I flew to Haiti with a mission team, prepared to ask the U.S. Embassy to let her out on a medical visa. The lady from the Embassy looked for a few key documents, gave us ZERO grief and told us she would have a visa ready THAT AFTERNOON. I love this story because it illustrates SO WELL that what seems impossible to man, is clearly not all that big of a deal to God. He can do whatever He wants, and He does. 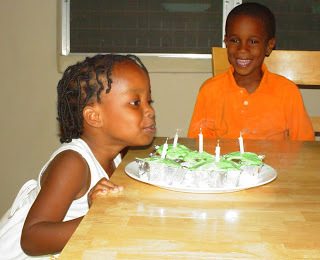 Hope came home to MN in September, not as our child in the legal sense, but on a 90 day visa. She had surgery a few days after arriving in the USA. She came through like a champ but required a second surgery 40 days later. In between the two surgeries her adoption was legally completed and we returned with her to Haiti to finalize the legal end of things and to pick up Isaac who was then also ready to come to Minnesota. 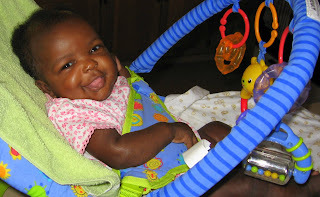 Our health insurance would not cover the surgery if the adoption was not completed within 30 days of the surgery date. We did what any parent would do and decided that if it was not covered we would figure out how to pay the HUGE bill later. The adoption was completed and Hope immigrated on the 29th day after surgery. If that is not a gift from God, we're not sure what is. Hope has been with our family since she was nine months old. She fought through kidney stones and dehydration. She is an incredibly resilient little girl. 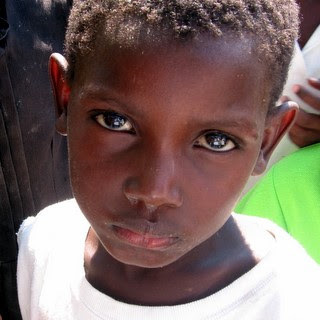 Recently we received an email from someone who is "opposed to Americans adopting children from Haiti." It was fairly narrow in its thinking, it also lacked understanding of the big picture. I have never been one to see things in such black and white terms. I don't think adoption is wrong AND I don't think all orphaned or poor kids are meant to be adopted. As usual, somewhere in the middle lies the truth. I prefer to see families stay united. The fact that orphans all over the world languish in institutions is heartbreaking and adoption into a family certainly beats institutional living any day. So much needs to happen to break the systems that poverty create. We have come to have a strong relationship with Hope's first mom and her older biological sisters; we are so grateful for that. We LOVE you HOPIE - JESUS loves you!! Have you noticed that the Christmas season is more like "let's get ready to rumble" than it does "O holy night"? The midnight releases of video consoles, video games, movies, books and specialty gifts have caused rowdy stampedes. We've seen grown adults trample each other and get into fistfights over places in line and who got to a toy first. Yikes! Then from many who come from the normally dysfunctional family, there is all the family baggage that gets unwrapped with the Christmas presents. Innocent statements are misinterpreted resulting in hurt feelings. Stiletto sharp innuendos are used to carve up folks who are supposed to love one another. And then fights break out because someone corrects or disciplines someone else's child. Double yikes! Even the pilgrimages back to Bethlehem to celebrate the birth of Christ are complicated by the ongoing war between Jews, Muslims, and Christians in the very place where Jesus was born. These tensions threaten all of world peace in the land where the Prince of Peace lived, died, and rose again. Triple yikes! While there is much about the Bible's account of Jesus' birth that is precious and touching, I believe it is also important to remind us that the Jesus story is not all sweetness and light. One of the most horrific stories in the New Testament is centered around the birth of Jesus. This story is sometimes called "The Slaughter of the Innocents." The Lord himself said, "And you will hear of wars and rumors of wars; see that you are not alarmed ... (Matthew 24:6 NRS). We live in a free for all planet where sin has marred every level of relationships. The whole story of Jesus' coming is tied to the real world in which we live. God didn't prepare a pristine time where his Son could be protected and coddled! Jesus was born into a vicious world of hate, war, struggle, and jealously. These fruits of hell would be ever-present for each step he took on the little blue planet he created. God had to use an angelic vision to warn Joseph and Mary to take the baby Jesus away to prevent his slaughter. Even from the first moments of Jesus' arrival, even while listening to the angelic choir singing "gloria in excelcis deo", we hear the rumblings of Herod's jealous and paranoid bile. So when things seem bleak or difficult or fractured in the coming days of Christmas, please remember, these are as much a reminder of why Jesus came as are the sweet sounds of angels, the excited presence of Shepherds, and the mysterious journey of the magi. Jesus came to save a broken world. 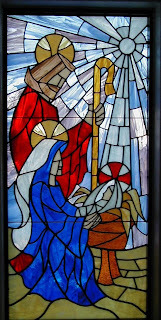 He didn't do it from afar, but from up close ... in person ... beginning in a manger ... going to a cross ... before conquering death and leaving behind an empty tomb. We have been gone all day. We dropped our peeps to the airport, then ran a bunch of errands. Hopefully the final result will mean no more trips to Port until Saturday when the next group departs. There are certainly days here where you feel all of your patience is being tested and everyone is just waiting for you to blow your top. That was the first part of today. It took 57 minutes to get out of the mission compound. Everybody and their brother needed something at the time we were to be departing. Starting off 57 minutes behind schedule can set the tone for your morning. The traffic was horrible getting to the airport, everybody seemed to be driving even worse than usual, all the routes had back ups, a semi-trailer with a loooong flat-bed directly in front of us decided to turn around in a spot where a Ford Focus might have had trouble turning around, etc, etc... Chaos, annoyance, madness, dirt, dust, traffic ... you get the picture. We ended up needing to cut out two stops that we had planned, but made it to the airport in time. Troy had the quote of the day. We were discussing how hard it is to let everything roll off, how a high strung or demanding person would go bonkers in this country ... I said something about how you HAVE HAVE HAVE TO attempt to let Christ control your mouth and temper. Troy said, "Yeah, well today the Christ that lives within me needs to knock me unconscious so we can get something done!" At the airport we hugged and had our teary goodbye and the airport guys were cranky and telling us to get out of our parking spot .... not in a nice way either. There was no reason for us to be moved out of the spot we were in, it was just an opportunity to posture and throw around some weight. Troy told them to back off and we would move when we were ready to move. They kept crabbing and creating the usual drama and we just sort of ignored them. 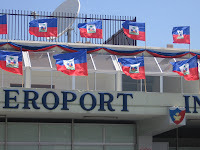 Then a guy that we often work with at the airport walked up to the men who were yelling at us and said "Hey, He (Troy) is not a blan, you leave him alone, he's Haitian!" HA. I don't know what Troy did to receive dual citizenship- it was entertaining to learn that somebody (anybody at all) thinks he is not just one of the many clueless blans. He's gaining popularity. One of our errands was to replace our dead water cooler. Something about an 88 degree glass of water is just not all that refreshing. We went to buy this beauty to the left on Delmas today. It is a little weird how EXCITING a purchase like this is here. It might as well be some high-end, high-tech, new to the market electronic item ... we are super-psyched. All the cold water you can drink is available to you if you come visit. Free of charge. You can thank us later. There are all sorts of rumors and reports swirling about. President Preval reportedly has Prostate Cancer and everyone is positioning themselves to have a say in who his successor will be ... And of course, we have no idea how true any of it is. One person told us today that Preval has six months to live and that things will continue to heat up. There is no way to really know what is a load of crap and what is truth. We've never been ones to trust the media, and we certainly don't want to base anything off of gossip and rumors. All of this is just to say that people are cautiously watching the situation right now, for us there is not much to fear, it is simply important to pay attention to your surroundings when you go into town. When the going gets tough, the tough get tougher. Thankfully, we're generally calm, happy and safe and life never changes too much in the village. Plus, Jesus commands our destiny just as He did when we travelled around on busy highways and interstates in the dangerous (and lovely) state of Minnesota. It is a bummer that things are heating up during a time of year where peace and tranquility and reflection on the Saviors birth is where we want to focus our attention. But He came into a very troubled world, and while it is discouraging that much of the world is stuck in chaos and upheaval, we have hope in the promise of His return. He came for that very reason. To give us hope. 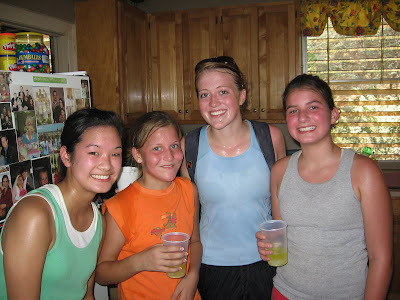 Our last stop today was to pick up mail at a friends house, they had been to Agape for us on Saturday. 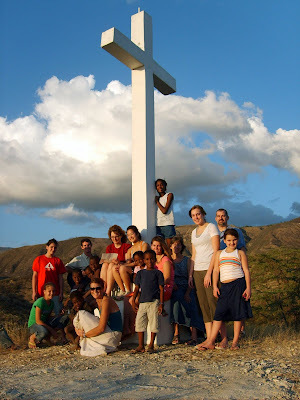 We have learned that as of now there is just one more flight coming into Haiti with mail for missionaries. They are working on fixing their issues, but it could be a while. We're checking into other options in the meantime. youer pictrues is cool. I bet you have a vary nice family. Heres a vers from a bible - for God so loves the wourld that he gave his oley son. you rock. Dear Hope, do you like Jupiter? I do! did you now it is the biggest planet. do you go to church? do you like fruit? I do. Do you swim? I can. Hey Britt you know god and jesus are always loveing you forever you just have love in him and follow the 10 commadments - here they are: (inserted a sticker with the 10 commandments on it) Now about me. I'm 10 years old and I'm in fourth grade and I go to pinewood elementurie. I'm sorry I'm not a good speller. I hope you have a great mission trip in Haiti God blesses you and so does everyone. God DOES bless us. Thank you very much for allowing Him to use you to do that. Everybody around here is turning five these days. We celebrated our Christmas Eve baby girl a few days early ... Because - really - let's be honest - Christmas birthdays just don't get the fanfare and attention that March birthdays do. We needed to separate the events by a few days. Here are photos from the pow-wow. Isaac was VERY happy for Hope. He thinks it is just great that she "got a new number." He displayed not even one ounce of jealousy. He's a lot like his dad that way.